Law professor Woodrow Hartzog told the graduates of Samford University’s Cumberland School of Law he wanted to try something different in his commencement address to the Class of 2015. Instead of "the standard advice a commencement speaker is supposed to give," said Hartzog, "I want to identify the traits of a Cumberland lawyer through my experience at this school." Speaking to an audience of about 1,200 May 15 in Samford’s Wright Center, Hartzog listed five traits of a Cumberland lawyer "that make us who we are." He added, "They are traits I learned as a student and that I try to teach as a professor. "I hope you can see them in yourself as well, and draw upon them as you start your legal career," said Hartzog, an associate professor in the law school. Cumberland lawyers are relentless, said Hartzog. He told the class how he bombed his first semester in law school because he had no idea what he was doing. But his professors and classmates picked him up and helped him study harder and smarter, he said. "It paid off and I never forgot the value of persistence." Hartzog said persistence and patience paid off again later when he was seeking a job as an intellectual property attorney with the federal government in Washington. He said he flew to D.C. to interview but didn’t get the job. He stayed in touch and then "out of the blue" he got a call asking if he were still interested. "The lesson, I suppose, is that victory through attrition is still a victory," he said. Second, said Hartzog, Cumberland lawyers know life outside the law. He cited classmates that ran their own businesses while in law school, and students that volunteered in their communities, that coached youth sports teams, served as disc jockeys on weekends and even auditioned for movies. He was part of a band, he said. Third, Cumberland lawyers take themselves just seriously enough. "Cumberlanders," a word he admitted he may have just made up, are funny and know how to laugh at themselves. Fourth, Cumberland lawyers are loyal. "As a litigator, I had Cumberland grads as mentors," he said. "When I worked in Washington, D.C., Cumberland grads who were otherwise strangers would go out of their way to meet up with me and give me some advice on how to make it in the city." Five, Cumberland lawyers are in the people business. "It’s easy to get caught up in the x’s and o’s of the law," said Hartzog. "But the trait that I hope we walk away with is that the law is about people. Helping people and forming relationships." 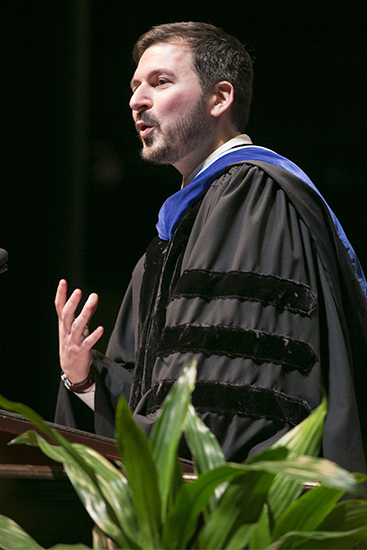 Hartzog told the graduates, "Three years ago I walked into a classroom that many of you were sitting in and we began your legal education together. The first part is now over, you have been exceptional, and I can’t wait to see what you do next." Also at the law school commencement, Cumberland presented its annual Daniel Austin Brewer Professionalism Award to senior Robert J. Sewell of Auburn, Alabama.